It should be safe to say that good music is not boring, and has elements to keep the listener's attention. Typically, songs have a beat, melody, harmony, and other elements. (Except the stuff that the strange woman in the upstairs apartment plays.) Jazz offers improvisation, composing and innovating on the spot. Real music is quite intricate. Music and creativity are baffling enough for Darwinists, but it gets worse for them because our alleged cousins lack such skills. You cannot say to an ape, "Hey, Kala! Give us a song. How about one of the lullabies you sang to Tarzan?" Can't happen, old son. To make matters worse for evolutionists, birds (which are not closely related to us in Evo-Speak) have intricate and innovative musical abilities. This further shows that our Creator gave special abilities that show no signs of evolution. A recent paper by an international team of researchers shows that the skill of some songbirds to extemporaneously innovate musical repertoire equals that of human musicians. Since none of the apes have this complex human-like capability, the discovery poses a big problem for the evolutionary model of human origins. By itself, the mysterious and inherent musical ability of humans presents a major problem for evolutionary proponents. Rhythm and synchronous ability do not provide any apparent selectable advantage for survival. Plus, the intricate neural wiring required for such a complex trait must be engineered in just the right way for it to function. An additional evolutionary anomaly is brought to light by this research: the only other types of creatures with this unique ability are certain species of birds and, in one documented case, an elephant—creatures not directly related to humans on the evolutionary tree. 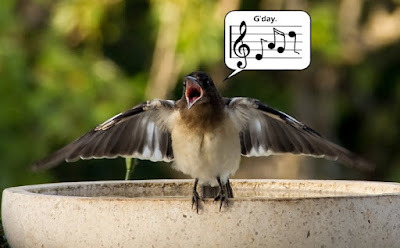 To read the rest, click on "Musical Bird Maestros Befuddle Evolution". Also, a video of the Christian jazz group Koinonia performing ""Goodbye-Means God Be With You" in 1984 is below.